Though I’ve been embracing lots of color this season, there is something so chic about mixing different textures of this creamy hue for winter. I love the white monochrome look & even tried it myself last summer in this post (more examples of this style that I’m loving & have recently pinned are here, here & here.) 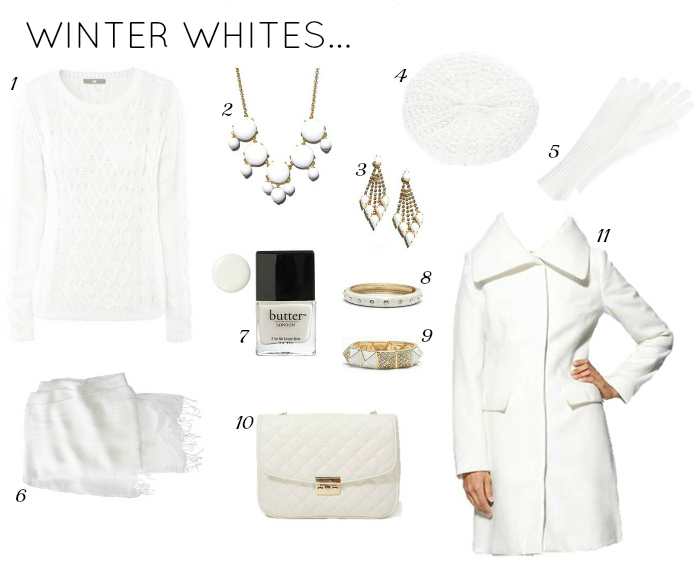 So, now I’m on the hunt for some snowy white pieces to add into my cold-weather wardrobe. 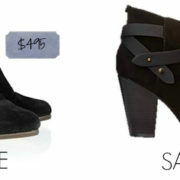 I’ve got my eye on these picks below, which all happen to be under $60! oOoOo…i LOVE winter white. 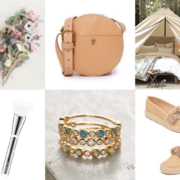 great finds…and even greater prices! love that white coat! I have a winter white coat and never wear it as I always manage to get it dirty! YES! I love white in the winter. Let's put that stupid Labor Day crap to rest once and for all! I mean, wouldn't no white after Labor Day technically mean no Santa's beard and no snow and no Christmas lights? Yeah Mr. Grinch, we're onto you and your Labor Day rule. You always manage to make finding affordable fashion easy – I don't know how to thank you for being such a wonderful resource for all of us recent college grads making, almost literally, pennies! Love the post, love the inspiration. Thanks for sharing. Oooh, I forget about white in the winter sometime… gotta get some pretty white accessories like these so I can dress the part this season! Winter white is one of my FAVE looks! It's so cozy and clean at the same time – and everyone looks good in white (or at least ivory!). I love white in the winter. I haven't painted my nails white in a long time so maybe I will do that soon. White is such a classic look I love it. I'm all for winter whites…that coat is lovely! Winter whites are so chic! How perfect would a white coat/ knit hat combo be? I love winter white outfits! So classy and elegant. Thanks for all the great choices you shared. 20 more days. I am not one of those people that can wear white period. I always end up spilling something on it!! I'm really loving winter white right now! Just bought a white lace skirt and sweater which I'm hoping to put together soon! Cute picks! Loving those earrings and the coat! Great finds! I love the idea of winter camouflage! I just discovered Tinley road, and that coat is perfect! What are you going to do for bottoms? someone else just posted about winter white too! I really want to try it, but I feel like it might make me look extra pale? I love white for the winter! nice selection! I'm terrified of wearing white, but what a gorgeous coat! Great choices!! I just did a winter white feature myself and since then felt inspired to lighten things up despite the freezing temps. Thanks for sharing.